The Army Research Laboratory (ARL) has sought an efficient design for small unmanned aerial vehicles (UAVs) for U.S. Army reconnaissance use. 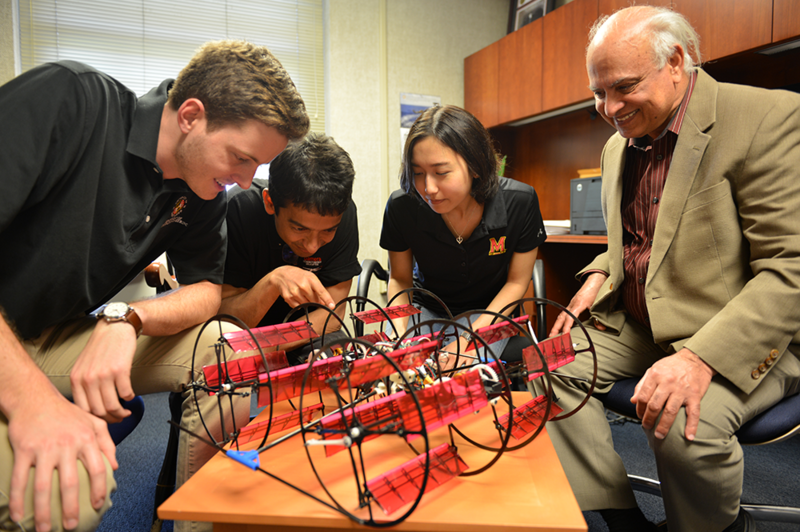 Under ARL, the Micro Autonomous Systems and Technology program's Collaborative Technology Alliance (MAST-CTA) was created to recruit research universities for this purpose, including the University of Maryland. UMD's research team, All-Terrain Cyclocopter, was highlighted in the American Helicopter Society (AHS) International's latest Vertiflite magazine publication for its innovative cyclocopter design developed while working towards ARL's goal. ARL wants autonomous (self-flying) UAVs that are small enough to fit in a soldier's hand, but can maintain stability in wind turbulence and traverse crowded environments. As more traditional micro air vehicle (MAV) designs have proved unsuccessful in the past, MAST-CTA turned to a less conventional option: the cyclocopter. A cyclocopter acts similarly to a helicopter, but moves with more control due to its design, which includes larger cycloidal rotors—similar to the cylindrical paddlewheels on riverboats—on either side of the vehicle, with rotating blades inside the rotors. The decision by ARL to invest in cyclocopters brought UMD to the center of the program's research. "The [cyclocopter] concept has been around for a long time," said Brett Piekarski, collaborative alliance manager at MAST-CTA, in the Vertiflite article, "but nobody had successfully demonstrated the capability in sustained controlled flight—which Maryland, of course, has done through a lot of developmental understanding of the program." Thanks to the Alfred Gessow Rotorcraft Center, UMD has been at the forefront of cyclocopter development for years. Beginning in 2011, UMD researchers performed the first-ever stable flight of a cyclocopter MAV. In 2015, they had the successful hover of the first palm-sized cyclocopter. And in 2017, they created the first cyclocopter capable of aerial, terrestrial, and aquatic locomotion—the vehicle that would be the recent highlight in their work for ARL. Led by Inderjit Chopra, director of the Alfred Gessow Rotorcraft Center and Distinguished University Professor, the All-Terrain Cyclocopter team included Graduate Research Assistant Elena Shrestha, Undergraduate Research Assistants Brian Davis and Benjamin Williams, and mentors Vikram Hrishikeshavan, assistant research scientist, and Derrick Yeo, assistant clinical professor. Moble Benedict was another key person working on the cyclocopter concept. Now an assistant professor at Texas A&M, Benedict is noted by the UMD team as a pioneer for cyclocopter research at Maryland. The All-Terrain Cyclocopter team also recognizes the contributions of undergraduate research assistants who have been vital to cyclocopter development over the years, including Brooks Muller, Sachin Ramprashad, Gerald Andrews, Victoria Martz, Loic Barret, Paige Pruce, Jonathan Detero, David Hairumian, Logan Gibbs, Nicholas Rehm, and Max Schlussel. In the latest publication of the AHS's Vertiflite magazine, All-Terrain's research contributions and advances in cyclocopter development were recognized in the article "Cyclocopter: Paddlewheel Propulsion Is Now Vertical and Multi-Modal" written by John M. Doyle.